Boat Description The actual running surface of the hull is what gives the Lowe Angler AN140T the edge over other V-designs. 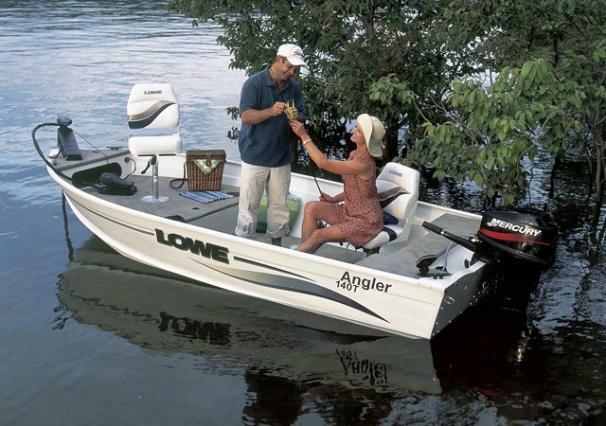 Anglers provide more usable space, better stability running and fishing, and a smoother, drier ride. Fishing features include extra-large rod and tackle storage lockers, cavernous aerated livewells with rounded corners, and a multitude of seating arrangements all set in a handsomely finished interior. And with SuperLock Bonded Construction tough, durable marine carpet and stain resistant vinyl seating, this model will stay looking good for years to come.